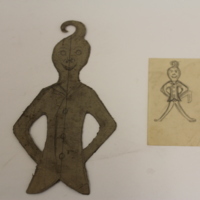 A sketch and stencil of an andiron in the shape of an anthropomorphic character. Arden Andiron Stencil and Sketch, The Arden Craft Shop Museum, Arden, DE. “Arden Iron Andiron,” DelaWARES.org, accessed April 23, 2019, http://delawares.org/items/show/200.